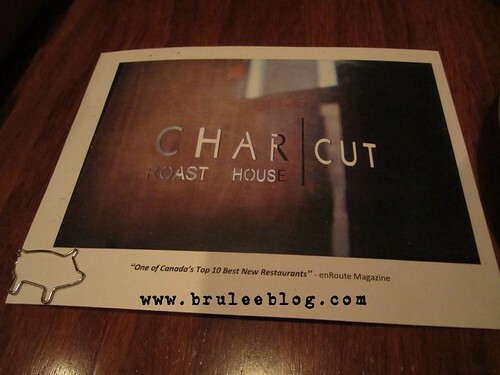 Even before Connie DeSousa appeared on Top Chef Canada, CHARCUT Roast House has created a lot of buzz. An enRoute Canada’s Best New Restaurant for 2010, their charcuterie and alley burgers (served in the back alley at various times announced on Twitter) has kept their name on the lips of people in Calgary and beyond. I ate there with a friend back in February, coincidentally just 10 days before the names of the Top Chef Canada contestants were released. We ended up getting the same entrée, but different sides. 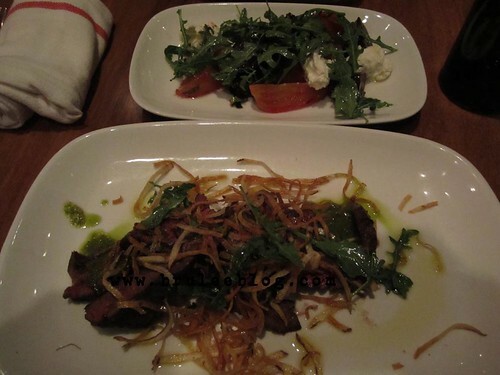 For an entrée we had the Spring Creek Butcher Steak, with arugula, fried matchstick potatoes, and chimichurri. It was probably one of the best steaks I’ve ever had. The meat was so tender that it practically melted in your mouth. 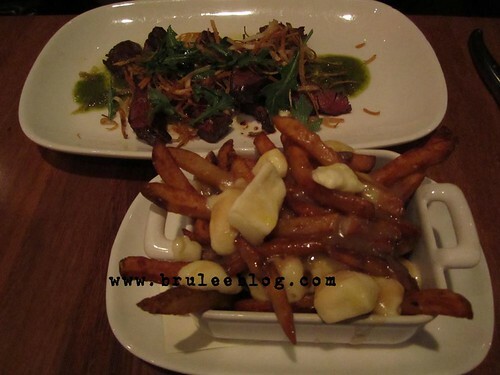 My friend also ordered the duck fat fried poutine served with cheese curds and truffle gravy. It was delicious and so very rich. So rich in fact that we couldn’t finish it even though I ended up trying to help her eat the dish. We were stuffed silly. I could easily see this dish being a good appetizer for 3 to 4 people. It’s definitely something that you need to share. I was sad that they cut out Connie’s Top Chef Canada’s poutine Quickfire challenge because I wanted to know if she had made this version for the competition or not. The other side that we ordered was the slow roasted heirloom beets served with house-made soft goat cheese and arugula. The beets were tender and slightly sweet, but to me the star of this dish was the goat cheese. It was creamy and fluffy, and had a light tang instead of a strong tang that you find in many goat cheeses. For dessert my friend had cheesecake in a jar. 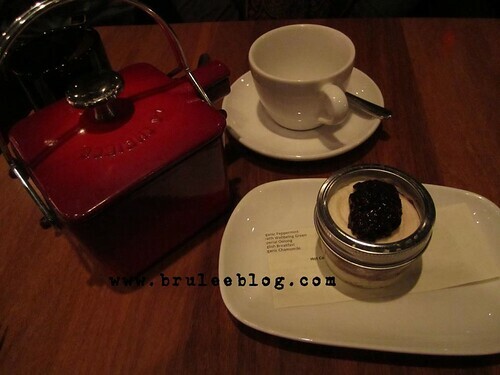 I think they were preserved saskatoon berries, but my memory is a little hazy. The cheesecake was light and fluffy. I had the flourless chocolate cake with graham crackers and ice cream. 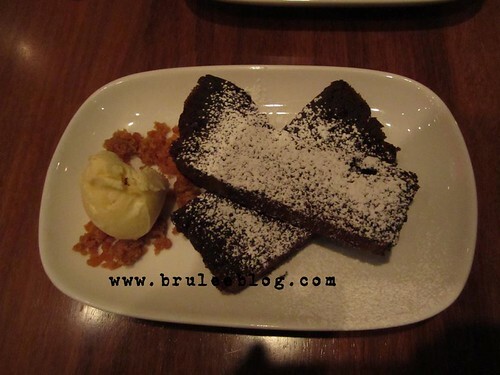 It was dense and chocolately, with a brownie-like texture. I ended up having to bring some of it away with me because of being much too full from all the good food. Our receipt was delivered with a postcard and the cutest little pig paper clip. Alley burgers were actually being served later that night but I was too stuffed to even think about eating them. I had a great meal and would definitely come back again. P.S. Did you know that I’m doing interviews with the Top Chef contestants? You can read all the other past interviews by using this Top Chef Canada list. 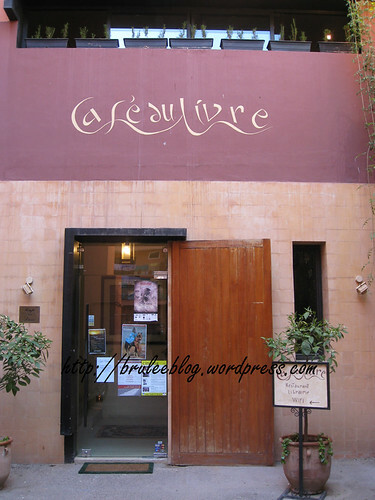 Café du Livre is a bookstore/restaurant that specializes in international food and is often visited by ex-pats and book lovers. Located outside of the medina in the French colonial area of Marrakech, it is hidden away around a corner and is a quiet place to get away from the hustle and bustle of the streets. Here you can eat a meal, peruse their bookshelves, and take advantage of their wifi. 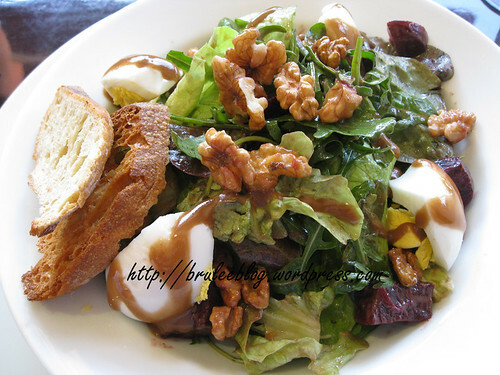 I had a Brasserie Lipp salad – arugula (rocket), lettuce, beets, walnuts and hardboiled eggs, with an olive oil dressing and garlic bread. I can’t remember precisely but I think this was a club sandwich. 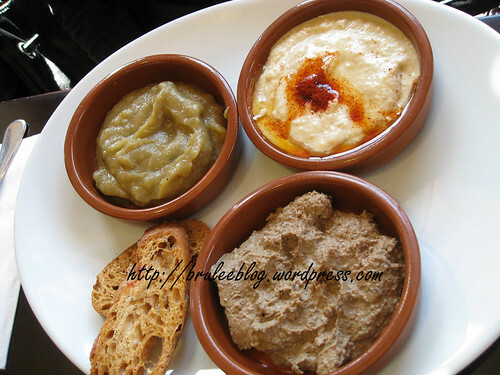 Shared appetizers with crusty bread – hummus, baba ganoush, and I think the last was a tapenade. There are a couple of different sandwich chains that are scattered all over London. 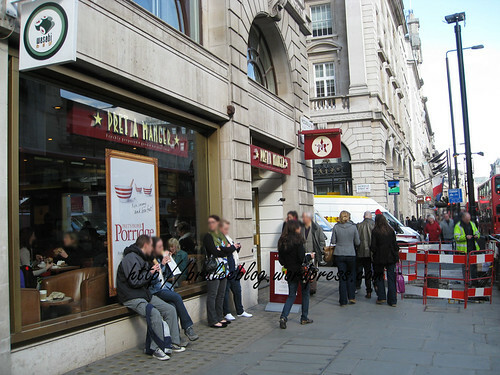 I visited one called Pret A Manger for a quick bite to eat before heading over to the Royal Academy of Arts for their Real Van Gogh exhibit (which was one of the best special exhibits that I’ve seen in a long time, by the way). It was really, really busy inside. And yes, they sell porridge for breakfast! I found the sign interesting but I never did try it for myself. 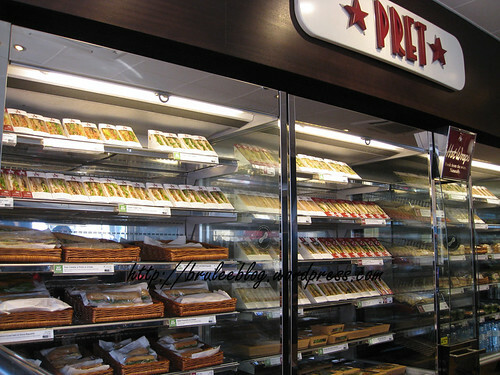 Pret serves a number of different sandwiches, wraps, soups, salads, pastries, coffee, tea, etc. The line up was pretty long for the hot food but I grabbed a quick, ready-made sandwich instead. I had a plethora of options to choose from. Posh cheddar and pickle? Pole and line caught tuna? Crayfish and rocket (a.k.a. arugula)? 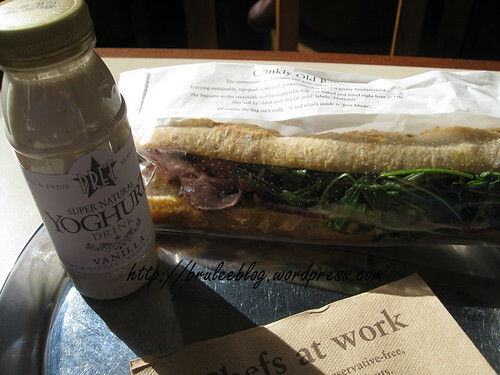 After much thought (and while sneaking photos of the sandwich cooler), I finally settled on the Topside of Beef and Rocket on an Artisan Baguette as well as a Vanilla Bean and Honey Yoghurt drink. 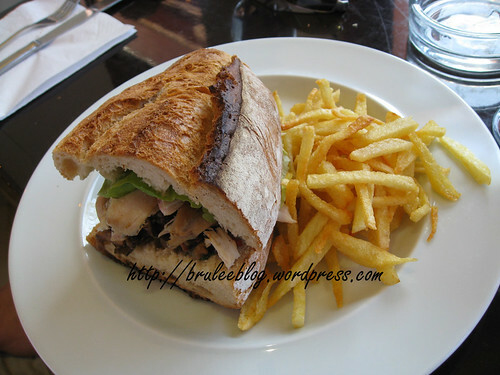 The baguette was filled with slices of medium-rare beef, English mustard, red onion, and peppery rocket. 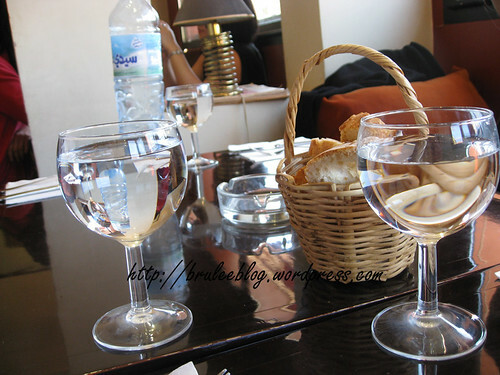 The yogurt drink (or should I spell it yoghurt) was made of yogurt, apple juice, honey and vanilla. You could even see vanilla bean flecks throughout the drink. Everything in the meal was fresh, preservative-free, and delicious. And bonus, I even managed to snag a table once I paid for my meal! P.S. 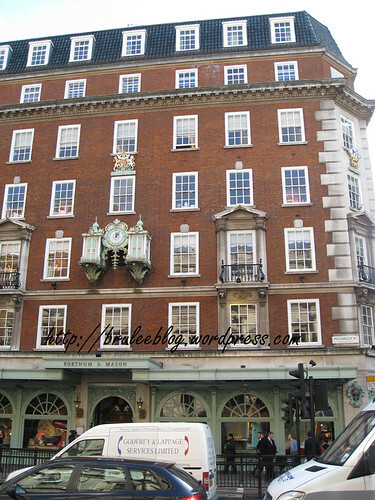 As I left I noticed the building across the street – Fortnum & Mason, a high-end grocery store, tea shop and department store that was founded in 1707. I didn’t have time go in and explore though, so unfortunately I only got a shot of the outside.